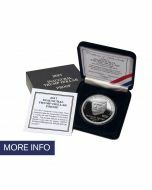 The 2017 Gold Proof Inaugural Trump Dollar Set includes the unique Double Split Gold Piedfort, a Fine Silver Proof and a Pure Copper Proof. Please note that due to the demanding nature of minting the Gold Piedfort Proof coin and the higher than usual reject rate due to the unique minting process, each Gold Set is individually minted and serial numbered on the edge for each order. All three proofs are minted from with six strikes by the proofing press with the special Ultra High Relief (UHR) obverse die created from the original sculpture of Donald Trump to create a deep flawless mirror-like proof finish that cannot be confused with the lower relief, Brilliant Uncirculated editions. 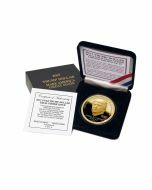 The 2017 Gold Proof Inaugural Trump Dollar Set is available at the special introductory price of $1995. 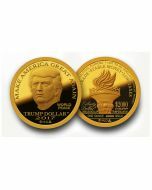 The 2017 Gold Proof Inaugural Trump Dollar Double Split Piedfort Set includes three specimens: 1) The special two ounce “Double Split Piedfort” Gold Proof Inaugural Trump Dollar that contains two half-ounce .9999 fine gold planchets sandwiched with a gold layered one ounce of .999 fine silver planchet in the center, 2) A Proof Silver Inaugural Trump Dollar with one ounce of .999 fine silver and 3) A Proof Copper Inaugural Trump Dollar with one AV ounce of pure copper. 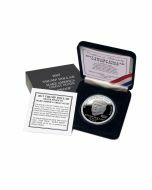 All three proofs are minted from with eight strikes by the proofing press with the special Ultra High Relief (UHR) obverse die created from the original sculpture of Donald Trump to create a deep flawless mirror-like proof finish that cannot be confused with the lower relief, Brilliant Uncirculated Editions. 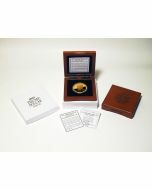 Please note that due to the unusual demanding nature of minting the Gold Piedfort Proof coin and the higher than usual reject rate due to the unique minting process, each Gold Set is individually minted, serial numbered on the edge, packaged in tamper proof capsules and secured in an engraved wood display case with a Certificate of Authenticity per order. So please allow 30 days for this unique process to reward you with the most stunning Inaugural Trump Dollar Gold Set. 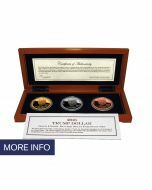 The Gold Piedfort Set was designed and engineered by Mintmaster Bernard von NotHaus to be the best, most innovative and most unique commemorative coin for an equally innovative and unique President. The 2017 Gold Proof Inaugural Trump Dollar Set is available at the special introductory price of $1995. Shipping may take up to 30 days as each Gold Piedfort Set is custom minted and numbered per your order. The Gold Inaugural Trump Dollar is only available in the 2017 Gold Proof Inaugural Trump Dollar Set. Please call 239.571.6050 if we can be of any assistance.